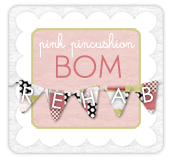 Cupcakes 'n Daisies: Blogger Girls BOM, It's a Wrap! As soon as I finished up my month 6 blocks for Monique's Blogger Girl BOM sew-along, I started working on my setting. That was back in May, because I needed to have my blocks done for the block reveal on June 1st. I made my blocks half as big as the pattern, they finish at 6 inches. Since my blocks were so small, Monique's block setting didn't really work with my little blocks, so I decided to come up with something else. So at this point, this project is just 26" x 26", and I wanted it to be a little bigger, so I added another border. 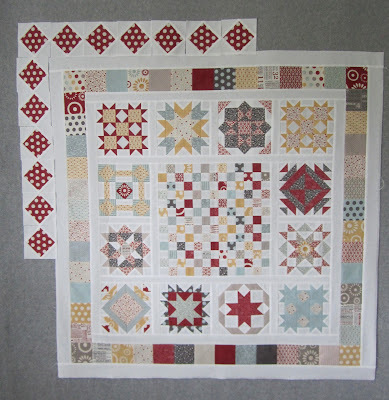 I thought I would add some bigger squares, to get a better look as some of the prints in those fabrics. My pieced blocks were small and it made it hard to really see the pretty design in this fabric. 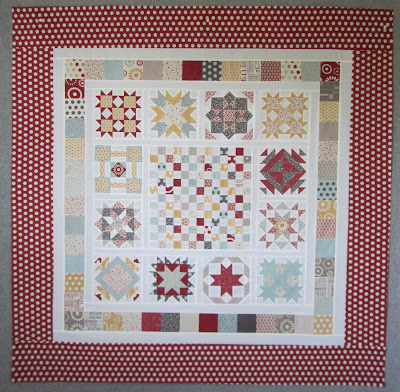 The whole time I was working on this project I knew one thing for sure, the red polka-dot print from Sweetwater's Hometown was going to be my outer border. So I added the border, took a picture, then put it up, one less thing on my To Do List, and something I didn't have to think about again until it was time for the parade. 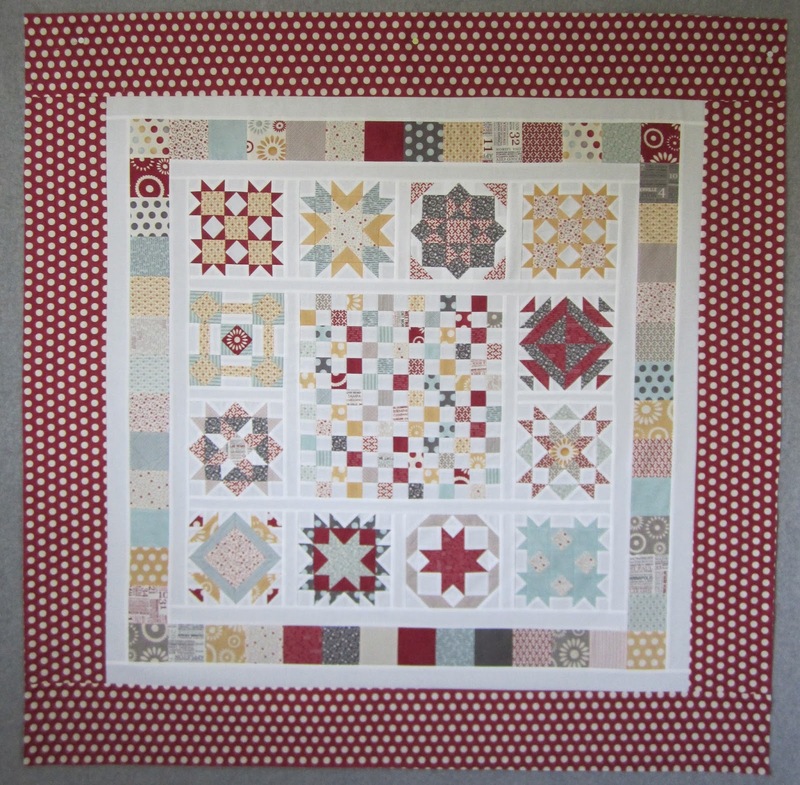 But I did think about it, even though the quilt was hanging in the closet, that red polka-dot border bothered me, I would look at that picture and wonder what was wrong, was the red too bold, the border too wide? Even though I was considering this project done, it was still driving me crazy. So I finally asked a friend what she thought of the border and she told me it was a matter of scale, that the dot print was too big for the small pieced center. That was it, I couldn't put my finger on the problem myself, but as soon as I read that explanation I agreed, that was the problem. So that gave me this weekend to come up with Plan B. At first I thought maybe adding some white to the dots would help. And tried this. But it didn't really help, the dots are still too big, even surrounded by white. So then I decided to add a plain white outer border, and I like it. I've never put a plain white outer border on a project so it's a nice change of pace. I guess I could use that polka-dot fabric for the binding, but I'm so over it I think I'll go with a yellow print instead. It finished at 44" x 44"
It has approximately 815 pieces. And a few more finishes out on Flckr that I couldn't match to a blog so check them out too. If you've finished your project we want to see it, leave a comment with a link to your blog if I missed you or add it to Flickr. And finally, thanks Monique for providing this free pattern and organizing the sew-along, I could not be happier with how mine turned out. There's another parade over at Santa's and Sherri's blogs, a Dulcinea parade, be sure to check it out too! Wow - what a great finish! You always put the most unique spin on patterns - changing them to suit your style. Your version looks great - the white outer border is perfect. nope I am not saving them for another project! what do you do with yours? 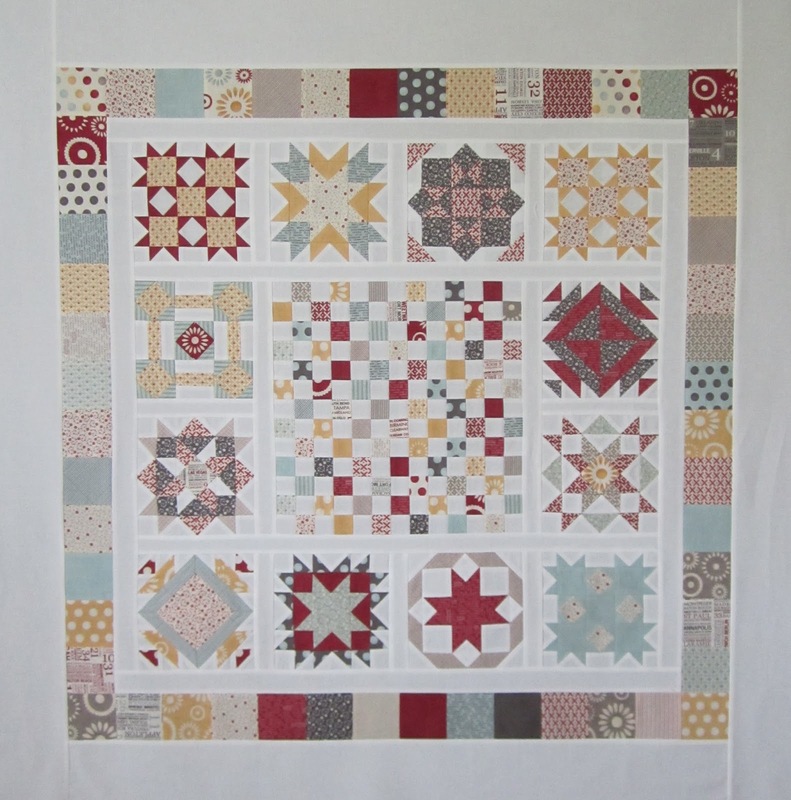 Someone told me once that not every quilt needs a pieced border. This is a perfect example of that!! Trust you to change the layout Thelma! When you do, it always turns out looking fine, even if it takes a couple of goes at it. I like how you've changed this into a wall hanging size but we still get to see the clever blocks and great fabrics. I love what you did here! Amazing and the white outer border is a good choice. Thelma, you never dissapoint! Love this quilt. Oh, I loved the red polka dot - I really did, but it's your quilt and you have to be happy with it. It's still beautiful - you did a great job on the blocks and laying it out. I love what you did with your blocks. Your border choices re perfect. Love the finished result. It really did get a bit lost in the red polka dots but now it stands out really well. I agree that the red polka dots were not right - made me a bit dizzy. LOL Keeping it simple with the white outer border is perfection. I love it, Thelma. I've enjoyed your journey with these blocks. I love it, Thelma! You inspired me with your setting. Thanks for doing the BOM with me! Love it! It reminds me of an old fashioned game board for some reason. I bet those little blocks are as cute as can be at half-size. Congrats on a great finish and thanks for including a description of your design process. Love how this turned out! Such a fun happy line. And I love the white border. Perfect finish! Thelma, your quilt is gorgeous! Love how you explained the process and totally agree with your new border. I finished my blocks in time, but haven't even started the border. Guess it will be my summer project! I love it!!! How about a scrappy binding? LOVE IT !!!!! I always enjoy it when you change a pattern to make it unique ! That white border is perfect ! It turned out fabulous! I agree totally about the polka dots being too large of scale. 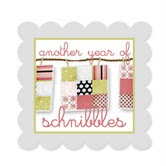 All I saw was the border, and not the fabulous piecing. I don't think it would even work as binding, so a yellow would be great. Thanks for adding my link! Oh wow. You always nail it with your colors! ;O) Wow! Love it! And I would love to make these small like yours - is it hard? You really amaze me!! You have been rocking those finishes!! You're making me feel like a slug. I've had my grandgirls for a bit, and we are leaving in the morning and returning them to Florida. I have sewn a few quilts of valor, but not near as stunning as what you have turned out. Oh, and we have a new great grandson, so had to make him something. Gosh, I should have been numbering all along too!!! When you sleep on a finish, it really wakes up! You've got the color thing down well, Miss Thelma!! I LOVE this quilt! It looks "scrappy" and I love the look. It always helps to get a second opinion if you are unsure. I would use the red dots for the binding. It's just beautiful Thelma...just as I knew it would be! Love love love as usual!! Wonderful! And I am going to totally steal your setting for a set of blocks I have had sitting in a box. Thanks for the ideas!